Audi is going the PSA (Peugeot Citroën) route in developing a hybrid system that doubles as an all-wheel drive conversion kit. 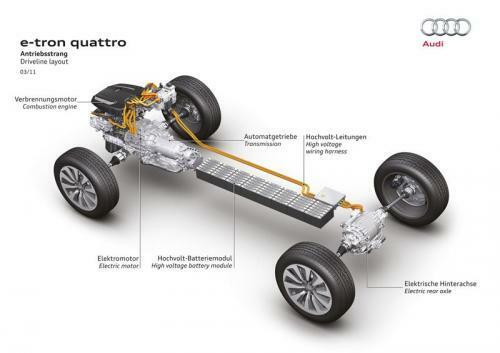 This is the A5 e-tron Quattro plug-in hybrid which matches a 2.0 liter TFSI engine with 211 PS (155 kW / 208 bhp) with two electric motors, one on each axle, that makes this A5 an all-electric capable vehicle. The electric motor at the front adds another 45 PS (33 kW) to the power going through the front wheels while an 81 PS (60 kW) electric motor at the back powers the rear axle. That rear-mounted motor only kicks in when acceleration requires it to or when sensors detect a loss of rear traction such as in a hard curve. Juice for the electric motors is supplied by a 9.4 kWh lithium-ion battery pack. With that electrical setup, the A5 e-tron Quattro can travel up to 40 km (25 miles) solely on electric power and is able to reach speeds of up to 100 km/h (62 mph). Overall, fuel-economy is rated at 2.7 liters/100 km with a 0 to 100 km/h sprint time of 5.9 seconds (0.6 seconds faster than the standard 2.0 liter TFSI A5) and a top speed of 228 km/h (142 mph). But this is just a prototype and Audi engineers have had to make use of carbon fiber and aluminum parts to counteract the weight gain of all that electrical gear to keep the curb weight around the same 1,600 kg (3,527 lbs) mark of the standard 2.0 TFSI A5 Quattro. We'll see if this prototype ever makes it to the streets but Peugeot is ready to prove the concept's market-viability by bringing the 3008 HYbrid4 all-wheel drive capable diesel-electric hybrid to market later this year.